Mortgage calculator with PMI, taxes, insurance, extra payments, simple and a compound method, EIR, HOA, Bi-Weekly. Why do you need a printable amortization schedule? Before you arrange the best loan scheme for you, it is good to calculate all expenses, fees, interest rates and everything else about it. It is crucial to have as many information as possible before you sign the contract with the bank or some other financial institution. Without this information, it is almost impossible to compare different loan schemes, so it is very important that you make a printable amortization schedule that will help you and give you a full picture of your yearly and monthly payments and costs. It is not enough only to create an amortization schedule online, but it is really smart that you print it and take it with you to the bank because it will certainly help you in the loan negotiation process. It is also good to have that kind of schedule for your own evidence, in case that you would like to look, when your payoff date is or when you would become a 20 % owner of your real estate – after that, you do not need to pay private mortgage insurance (PMI) anymore. Using printable amortization schedule you will always know the amount of principal and interest that are included in your payments, which is also definitely essential information for every person that poses the loan. 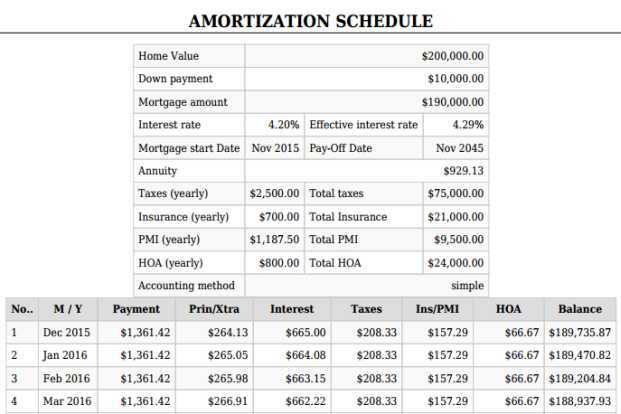 What a good printable amortization schedule shows you? Every amortization schedule should include all information about your loan and give you a complete and detailing view of periodic loan payments. Even that all payments are the same, the percentage of interest early in the schedule is bigger than later on, when you basically pay only for the principal. That means that in the beginning you will pay the majority of each periodic payment only for interest, so it is crucial that you know that and that the interest is as low as possible. This Mortgage Calculator have a good printable amortization schedule. Printable amortization scheme do not show you only the amount of principal and interest for each monthly payment, but also costs of taxes, insurance (PMI) and dues for homeowners’ association (HOA-Fee) that are an important part of expenses that you pay for your debt. You can see the amount of money you would have to pay for principal, interest and loan costs yearly or monthly for each payment. One-time or on-time yearly extra payments can be also included in printable amortization scheme. With this mortgage taxes calculator you can find out your obligations which will also include taxes. The printable amortization schedule can also include property taxes. The tax depends on the value of the property. Annual taxes amount is calculated and then divided by the number of payments per year. If you are paying monthly, the amount is divided by twelve. Be cautious, because the taxes rate may change. The majority of lenders demand that the property is insured. Insurance usually covers fire, lightning strikes, burglary, storms, explosions etc. You can also include this insurance to printable amortization schedule and take it into account of every payment. Mortgage insurance is usually required until 20% of property value is paid. PMI can be avoided if 20% deposit is paid. Amortization schedule can include special payments, depending on your requirements. If you expect higher inflow of money in the coming years and you want to use it to pay off the mortgage, or if you want to repay the loan quicker, enter that amount in “One-time” row and specify the month and year in which you would like to include it in the printable amortization schedule. If you have the regular annual inflow of money and you want to include it in repayment, enter the value in “One-time yearly” row. Specify the month in which the amount should be taken into account. If you would like to add some extra money in every installment, enter the amount in “For each payment” row. All these additional payments will shorten the age of paying off the mortgage and reduce the interest. The Simple method is the one that is usually used. Mortgage Calculator added the Compound method to only for specific needs. Here you have a mortgage calculator, which can calculate the effective interest rate. The effective interest rate tells how expensive the loan is. It helps to find the most suitable option for the loan. In the situation when one lender offers a loan with lower interest rate and requires PMI payment and the other one with higher interest rate but without PMI, the effective interest rate tells which loan is better. HOA contribution pay by property owners. The money is usually used for maintenance of common areas, tennis courts, swimming pools and the like this. You can also charge an additional contribution, if carried out major maintenance, such as replacing the roof or building elevators. Before buying a property, we must inquire how much is HOA contribution, as it can have an effect on whether we can afford this purchase.